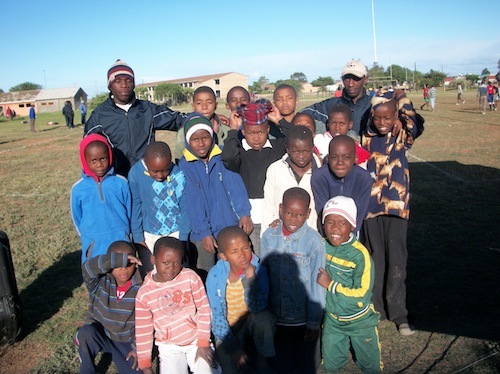 Ulwazi, which means “knowledge and awareness” in Xhosa, was the main message of this HCT and our theme of “Knowledge is Power: Know your HIV Status” was spread throughout players and the surrounding community. Despite the windy weather teams arrived at Enkwenkwezini and Siyaphambili High School in Motherwell, Port Elizabeth ready to compete. 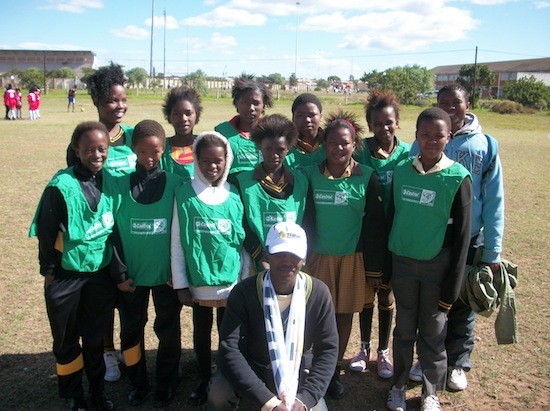 Teams could not win the tournament on their football skills alone however, but could also earn points by participating in GRS Skillz activities and HIV counseling and testing. To start the day off GRS coaches led an opening circle that included amazing singing, dancing and the classic Skillz activity “Find the Ball.” By the end of the opening the kids had not only been energized for the day but also educated with the key message from “Find the Ball” that you cannot tell if someone has HIV just by looking at him or her but the only way to know if someone is HIV positive is to get tested. Fourteen teams participated in the tournament-10 boys and 4 girls teams. Along with the soccer matches, teams took part in the Skillz activities of HIV Attacks, My Supporters, Risk Field and Talk Show. In total 280 youth and local community members were tested at the tournament. Everyone that participated in the tournament and tested received a prize. T-shirts were passed out to community members who tested, with the theme of “Knowledge is Power: Know your HIV Status” on the shirt. In addition prizes of pens, Skillz magazines, and water bottles were also passed out. At the end of a great day in the Motherwell township the overall winners of the Ulwazi Cup HCT were Kwa-Magxaki High School for the boys and Vulumzi High School for the girls. Both teams had great participation not only in the soccer aspect of the day but also in the GRS Skillz activities and HIV testing. These teams won printers (donated by Trink, a local printing company) for their schools along with trophies, soccer balls and jerseys. They all deserve a big KILO!